What is the difference between cubic zirconia and diamonds? Well there are a lot of differences and this is a question we get asked all the time! The main difference between cubic zirconia and diamonds is simple – a diamond is a naturally occurring mineral and CZs are man made. Many people even call cubic zirconia “man made diamonds” because to the lay person, it can be virtually impossible to distinguish between the two with a naked, untrained eye. Even though this detail is seemingly small, it actually makes for big differences across the board from price and aesthetics to the life of the stone because of their unique chemical structures. Before you commit, make sure you have all the facts! The cost is easily the first difference that comes to people’s minds. Because diamonds occur naturally and are not discovered as fast as a simulated diamond can be made in a lab, their rarity causes their price point to soar. On the other hand, cubic zirconia stones are extremely affordable; you can purchase a CZ engagement ring for less than $100. Instead of draining your bank account and starting your marriage in debt, think about using the money you saved to go on a trip where you will make memories together that will last a lifetime or use it for a down payment on your dream home. 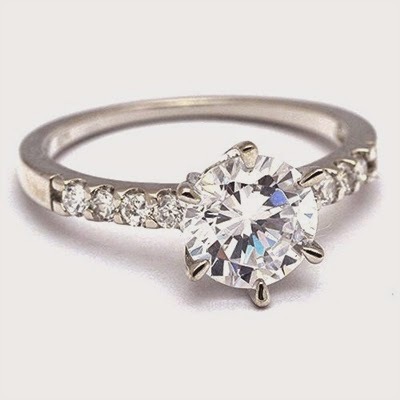 In fact, research shows that less expensive engagement rings is correlated with a lower divorce rate! While cubic zirconia stones are tough, they can’t hold up to the strength of a diamond. Diamond, after all, is the hardest natural material known to man (or woman). They can cut glass after all! To put things in perspective, a diamond measures a perfect 10 on the Mohs scale while cubic zirconia comes in at an 8.5. What does this mean to you? Simply that a diamond ring is going to stand up to scratches and daily ware-and-tear better than a CZ. Because CZs are man made, they can be produced to be absolutely colorless, lending to their overall clarity. Real diamonds often have a natural brown or yellow hue to them because of the nitrogen they contain. Real colorless diamonds are extremely rare! Added bonus: cubic zirconia stones can be made into every color of the rainbow without changing the ring in any other way. Lab techniques perfected over many years allow cubic zirconia stones to be produced with absolutely ZERO flaws! Since diamonds occur naturally, imperfections cannot be controlled for and so you may find various materials, scratches and mineral flecks embedded in the stone. Dispersion of cubic zirconia is higher than diamond making the prismatic fire more intense. English: your CZ ring is going to sparkle and catch the light way fiercer than any diamond could! Diamond dispersion is 0.044 while CZ is 0.060. Cubic zirconia crystals are heavyweights in comparison to diamonds; a cubic zirconia will weigh about 1.7 times more than a diamond of equivalent size. So if you aren’t use to wearing rings or worry about picking a ring that is too heavy, a cubic zirconia may not be for you. After reviewing the facts, if you have your heart set on a diamond and if knowing that your stone is a CZ and not a true diamond will bother you, then go for the diamond. Engagement and wedding rings are a big deal so it’s important that you absolutely love it! After all, you will be wearing it every day for the rest of your life. What are your thoughts? We would love to hear from you! Share your thoughts in the comments below and be sure to visit us at www.lovieartjewelry.com for all your wedding jewelry needs!